Zion Market Research has published a new report titled “Artificial Tendons and Ligaments Market by Application (Shoulder Injuries, Knee Injuries, Foot and Ankle Injuries, and Other Applications) and by Region: Global Industry Perspective, Comprehensive Analysis, and Forecast, 2017 - 2024”. 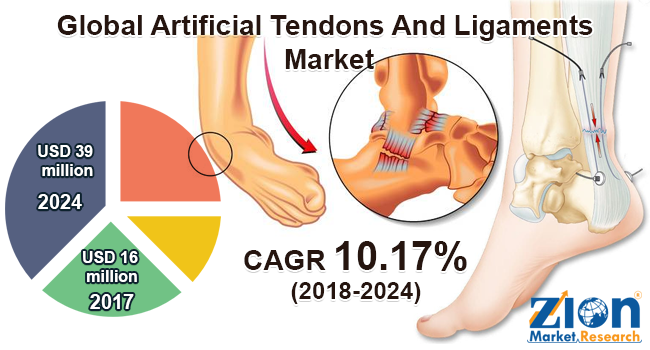 According to the report, global artificial tendons and ligaments market was valued at approximately USD 16 million in 2017 and is expected to generate revenue of around USD 39 million by end of 2024, growing at a CAGR of around 10.17% between 2018 and 2024. Tendon and ligament injuries and/or associated disorders are a common problem and one of the leading causes of improper functioning of joint affecting athletes, actively working people, and the geriatric population globally. Damaged tendons and ligaments or loss of tendon poses a major surgical reconstructive problem. It influences the quality of life of a patient, with movement and local structure integrity being adversely compromised. Ligaments and tendons both are essential parts of the musculoskeletal system. They are the crucial elements for the proper functioning of the muscular and skeletal system as they serve as a major function for the joints and bones. Global artificial tendons and ligaments market is mainly impacted due to rising incidences of sports injuries and escalated awareness about artificial tendons and ligaments. However, unwillingness to make utilization of artificial tendons and ligaments by healthcare providers and high-cost procedures may hinder the market expansion over the forecast timeline. Whereas, market expansion and product penetration in developing economies, consistent technological breakthroughs, and extensive R&D activities are anticipated to create lucrative growth opportunities for artificial tendons and ligaments market in the coming years. The artificial tendons and ligaments market is classified on the basis of application and region. On the basis of application, the market is segmented into shoulder injuries, knee injuries, foot and ankle injuries, and other injuries. Knee injuries segment accounted for the largest share of the global artificial tendons and ligaments market. The increasing rate of knee injuries, rising contribution in sports, discomfort due to conventional surgical treatment methods, and advantages of artificial tendons and ligaments over conventional surgical methods are the major factors driving the growth of the knee injury segment. Key regional segments of the market are Europe, North America, Latin America, Asia Pacific, and the Middle East and Africa. Due to the huge investment in research and development, countries including, the UK, the U.S., and China are likely to grow strongly in the coming years. North America is estimated to dominate the global artificial tendons and ligaments market in the near future. A growing number of sports injuries and increasing geriatric population coupled with a huge investment in the research and development activities in the region are the major factors responsible for the market growth in North America. On the other hand, Europe is also considered as the major market for artificial tendons and ligaments market. A growing number of government initiatives to boost sports, increasing cases of sports-related injuries, increasing number of conferences, symposia, meetings, and workshops in the U.K., a rising number of knee replacements are the major factors responsible for market growth in this region. Asia Pacific region is projected to grow at the highest rate in the international artificial tendons and ligaments market due to the emerging healthcare industry in Japan, growing research and development activities, collaborations with several international sports organizations, government initiatives, favorable tax policies in China,government initiatives to support sports medicine, encouraging healthcare system in India, focus of LARS in Australia, and focus on sports medicine in Malaysia and Singapore. Latin America is another important regional market and is estimated to grow moderately in the future due to the developing healthcare infrastructure and raising awareness among people for dental diseases. The Middle East and Africa region are anticipated to witness a significant growth during the forecast period. Some of the key players in the artificial tendons and ligaments market areLARS, Neoligaments, Cousin Biotech, FX Solutions, Shanghai PINE&POWER Biotech, Orthomed S.A.S., and Mathys AG Bettlach, and Arthrex, Inc., among others.